Minutes of meetings provide written summaries of the discussions and decisions made in meetings. They provide a valuable record for future reference, as well as transparency within an organization. Meeting management software like MeetingBooster helps you take accurate minutes of meetings. Try minutes of meetings software! Download this minutes of meetings sample! A minutes of meetings checklist lays out the various steps involved in setting up a meeting and covers 4 main stages. This information will be included in the final meeting minutes document. Learn more about writing minutes of meetings! Regardless of the minutes of meetings style, the note taker must quickly capture a significant amount of information throughout the meeting, which is not an easy task. That's why software that helps create accurate minutes of meetings is becoming increasingly popular. MeetingBooster allows note takers to quickly enter information based on a formalized agenda. The note taker simply selects an agenda topic, enters the speaker's name and notes what was said or decided. Taking minutes of meetings has never been easier! Simplify taking minutes of meetings with MeetingBooster! Once a meeting is adjourned, the note taker must re-type the captured information into formalized minutes of meetings containing company logos, standardized formatting, etc. This can be tedious and time-consuming, however using minutes of meetings software like MeetingBooster, note takers can quickly transform minutes of meetings into polished, professionally formatted documents that are easy to review, share and store. Following a meeting, every attendee should receive a copy of the minutes. Manually sending copies would be another tedious and time-consuming task. Minutes of meetings software like MeetingBooster automatically distribute formatted PDF documents of minutes of meetings to all designated attendees. It is important for meeting participants to be able to access the minutes of meetings any time and from any computer. Storing minutes of meetings online is an effective method for archiving and systems like MeetingBooster make minutes accessible to anyone with viewing permission. 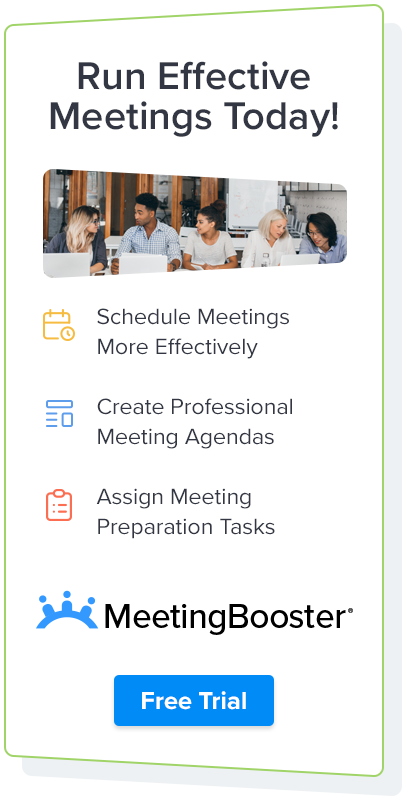 Try MeetingBooster minutes of meetings software now!